(Si quieres ver esta entrevista en Español, por favor ve aquí). In November 2012, we had the pleasure of interviewing Damian Blaum on this blog. Back then, Damian had already an enviable swimming career, having been ranked #2 in the year 4 years, among many other successes. We are very happy that this year Damian has been able to realize his lifelong dream of adding “World Champion” to his swimming career. Congrats Damian! 1) In 2007, 2009, 2010, 2012 you were #2 in the world. Did you do something different this year to become champion? This year my commitment to be #1 in the world was absolute. We were heading to practice without knowing at what time we would leave, very intense weeks, very hard sessions in and out of the water, 2 concentrations of 21 days each in Sierra Nevada,. This year was the hardest year of my career, but I accomplished the most important objective of my professional life. 2) When did you set as an objective to win the FINA World Championship GP? Petar Stoychev won 3 of the 4 years that I came in second. When he announced his retirement, I thought that my time had come. But in 2012 I lost the championship Trent Grimsey, and now in 2013 I finally won. I dreamed of this moment since childhood, and I had to work very hard to make this dream a reality. 3) Without giving away any secrets of your training , you could give us an idea of what is it consisted of? There is no secret in the training, a lot of quality practices and distance in the water, and also a lot of out of water training: weights , dryland , rowing, cycling, running . We had double sessions every day, and in both sessions we did quite a bit of out of the water training. Fred always says “he who does not run, does not swim”. If you can’t handle your body out of the water, you won’t do well in the water. 4 ) Can you highlight a specific moment this year when your mental strength was put to the test? I think the key moment was in Lake Magog (Canada). I had a very good first half of the World Tour , but I’m not happy with my performance in the last 4 races . Magog was key because all the swimmers that had a chance for the title were competing there. It was a race with big waves and with an intimidating storm. I competed strongly against an Italian swimmer (who was the candidate best positioned to take the title at that point), and then when he abandoned I was able to stay calm and think about winning the championship instead of the race. I scored some important points at that race and then in Ohrid (Macedonia) which allowed me to go to Capri with some margin. 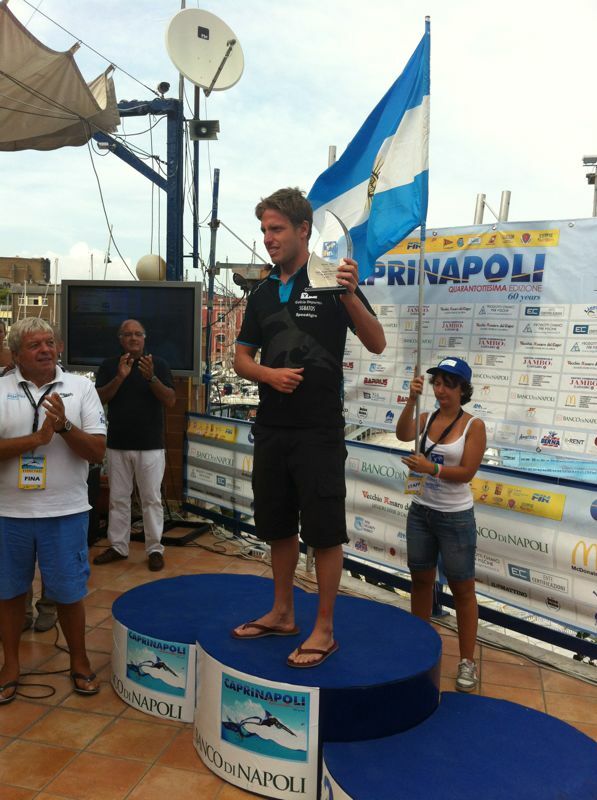 My race in Capri was not optimal, but with the victory of Brian Ryckeman, I won the World Championship by 1 point. 5) Please tell us about your nutrition, both before and during the races? I do not follow any particular diet. We just make sure to eat healthily, lots of carbohydrates, vegetables, fish 4 times a week and the rest we eat red or white meat. During the races I drink carbohydrate every 15min, and banana slices every hour. Halfway into the race I take some gels. If the race is a long ocean race, like in Capri, I drink some Coke to take away the salty taste in my mouth. 6) You’ll be back next year to compete in the FINA Grand Prix circuit? Most likely yes, but it is too early to define exactly what I will do. I have swum with the maximum tension and stress I could handle this season, and what I have clear is that I want to enjoy the races now that I’ve taken a heavy weight off my shoulders. I think I can swim more relaxed and enjoy things more. 7) What advice would you give to young swimmers who are dreaming about becoming the next world champions in this sport? I would tell them to never lose the desire to dream, and that with hard work, humility and with much sacrifice, it is possible to achieve their goals. This sport requires many hours of training, but it is rewarding to swim in beautiful places, enjoy nature, and have friends all over the world. This is great. 8) You and your wife Esther (world champion in 2007 and 2012, runner-up 2013 ) are now world champions. Is having each other in training and competitions and advantage? We have more experience, and we know well and we know what we can achieve and what not, but the good thing is we’re both in the same place at the most difficult times to support each other and carry on. Neither of us EVER gives up, we learn from each other, and the desire to win keeps us growing. 9) How will you celebrate your world championship? I celebrated with all the swimmers and with my coach at the Capri Napoli party. We then took two days to visit the beautiful island of Capri, had diners with our Sabadell family, and I am on a road trip in France, visiting friends and enjoying my time with Esther. Next week I will also celebrate with some friends in Cadaqués. Oh, and in two weeks, I will celebrate with my family and friends in Argentina. A dream come true.1) En 2007, 2009, 2010 y 2012 fuiste subcampeón del mundo. Has hecho algo distinto este año para llegar a ser campeón?